You want to get more traffic to your blog, right? This is a question I get asked quite a lot. So I thought it would be useful to talk about a really effective way you can start building more traffic. Growing my community is at the top of my list of priorities and it should be at the top of yours too. When you first start blogging, you focus more on commenting on Instagram posts and networking on Twitter. But a more powerful networking tool is Facebook groups. And they’re so powerful, that I even started my own. Connecting with other bloggers requires patience and diligence, especially in today’s noisy online world. You have to remember it takes time to cultivate relationships to gain loyalty from your readers. 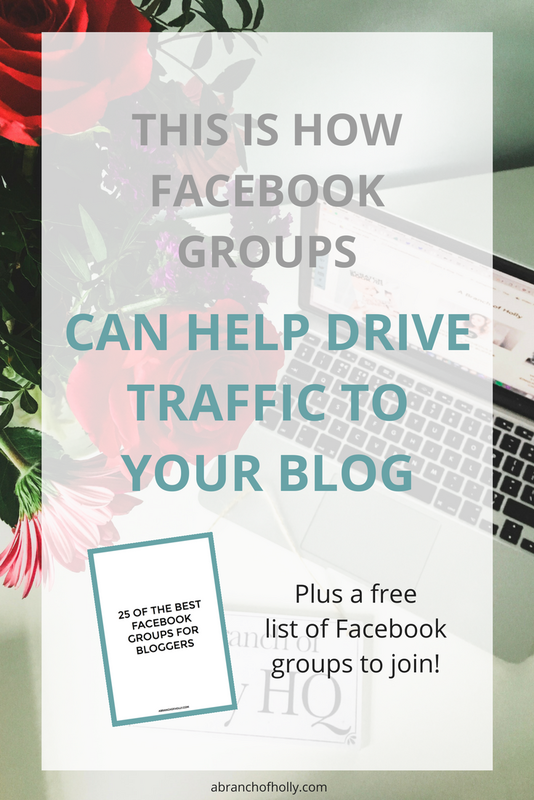 In this post I want to focus on how you can use Facebook groups to connect with other bloggers and help drive traffic to your blog. If you’re looking for some Facebook groups to join, be sure to download my free cheatsheet with my pick of the best ones! Each group has a set of rules and it’s important you pay attention to these. In some groups, you’ll be able to promote your content whenever. For other groups, there’ll be a specific day that you’re allowed to promote your stuff. You don’t want to get kicked out of a group for breaking the rules, so be sure to read them. Try and keep track of what rules each group has, because it’s your responsibility to adhere to them. You’ll usually find them in the description of the group down the right-hand side. This ain’t gonna word. Period. Don’t join groups just to promote yourself or your blog. Join groups because you want to make connections. Your purpose for every Facebook group you join should be to be as helpful as possible. You see those bloggers who are spammy and promotional to the point where it’s annoying. Don’t be like that. Be the one that people recognise for being valuable! If your expertise is health and wellness, join groups under that topic and help those asking questions about health and wellness. These are the people that could turn into a potential reader and subscriber. Top tip: If you’ve got a blog post relevant to a question someone is asking feel free to share that in a comment response to the question (or even better, start a private message with the person and send it over that way). I’ve been there where I’ve posted a question in a Facebook group and got some really negative, narky responses. Nobody likes like. Everyone will be at a different stage in their journey and will have a different level of knowledge. There is no such thing as a stupid question. Sometimes people just need to be pointed in the right direction. Join too many Facebook groups and you won’t be able to keep up with them all. You want to participate in your groups on a regular basis so choosing a handful will make this most effective for you. Feel free to join quite a few at first, then leave the ones that aren’t serving you. This will make it easier for you to participate and get to know people. Be active. Answer questions, share your opinion and help when someone asks for feedback. Being active means you will get your name out there, and that helps you gain more brand exposure. Facebook groups allow you to be seen as a resource of information in your niche. Share your advice and knowledge in the groups you are a part of as much as you can. Like I said earlier, some groups will have a specific day for sharing your own content. Take time to learn the days you can promote your offers in each group you’re a part of. You can make a spreadsheet to keep track of this information in an easier way. Top tip: Don’t just drop a link and run. Share the love on other people’s links and tell people why what you’re sharing will benefit them. You want to make sure you’re getting the best return on your time investment, so monitor the engagement in each of your Facebook groups. While you don’t want to join too many groups, you also don’t want to stay in groups that aren’t beneficial for you. Interact in them for around two weeks to see if they’re going to effectively help you grow your vlog. Replace inactive groups with new ones, until you have a list of 10-15 Facebook groups that you are engaging with on a regular basis. Following these steps will make it really effective for you to grow your blog with Facebook groups. They help you grow a community with your online presence and become a though leader within your industry. Employ the proper techniques and use Facebook groups as a marketing tool so you can make the most of your time and get one step closer to a breakthrough. P.S Don’t forget to download this cheatsheet and get access to 20 of the best Facebook groups for bloggers and business owners!